Stainless steel blades are sonically welded to plastic handles. Cut cleanly through a wide range of materials. Note: A minimum quantity of 108 must be ordered, and in units of 6 thereafter. 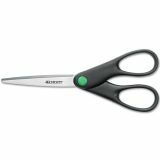 Westcott KleenEarth Recycled Stainless Steel Scissors, 7" Long, Black - Stainless steel shears feature plastic handles made from 70 percent recycled material and 30 percent post-consumer material. Design includes a matte finish and stainless blades. Inside and outside grinds provide smooth cutting.